The provision of sanitation is a key development intervention that increases health, well-being and economic productivity in communities around the world. Inadequate sanitation impacts individuals, households, communities and countries. Diarrhoea is one of three major childhood killers in Uganda, killing 33 children every day. In most cases, children get diarrhoea by drinking unsafe water or from contact with contaminated hands. But how does this link with wildlife conservation? In the Koome Islands of Uganda, one of the most significant environmental challenges faced by wildlife and the human communities they share their island and lake home with is the pollution of the lake waters caused by poor sanitation practices and improper disposal of plastic waste. With this in mind, CSWCT has worked closely with Born Free to address the issue of sanitation, including part funding of the building of bio digester toilets in Myende fishing village. 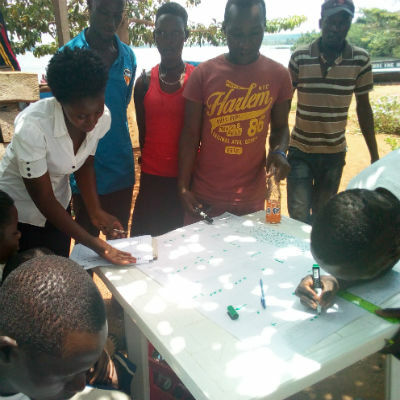 This year, a sanitation competition among four fishing villages – Myende (300 households), Kipaapali (200 households), Kiimi (750 households) and Zingola (450 households) – was organised with support from Born Free’s Global Friends Programme. Each fishing village had two winning households who will receive building materials (17 iron sheets and 3kg of nails) and the winning village will win building materials for a public toilet (including cement, iron bars, nails and iron sheets). The local community has welcomed the competition. Mr Lumala, chairman of the LC1 Zingoola fishing village, said: “The sanitation competition helped us to improve the standards of hygiene and sanitation in my locality and I’m already encouraging members to continue with the level of cleanliness.